To be fair, I spent my share of time avoiding such utterly common plants when I had a small garden. But here, I have a whole lot of space to fill, so I can’t be snooty about sturdy, dependable, and affordable plants. And if they’ll grow readily from seed without becoming self-sowing menaces, so much the better. There’s no need to coddle tiny, tissue-cultured plugs when it comes to Arkansas bluestar. 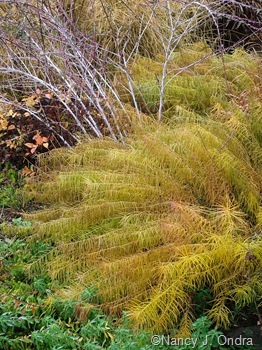 Sure, it takes a few years for the seedlings to bulk up into those glorious feathery mounds, but that’s better than waiting the same amount of time for a trendier selection to play “incredible shrinking perennial” and finally disappear. Maybe I too will eventually get bored with Arkansas bluestar, but for now, I’m happy to have it around, and I enjoy watching it interact with a wide variety of companions through the seasons. 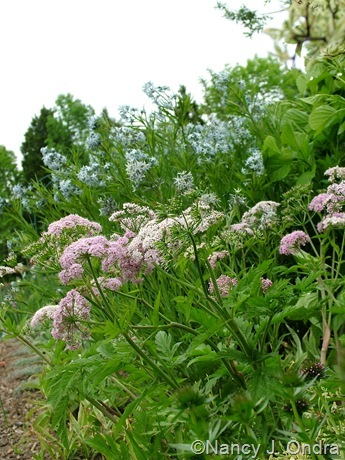 Here in southeastern Pennsylvania, Arkansas bluestar comes into bloom in the first or second week of May and continues into the first or second week of June. Its light blue color looks great with white, silvery, and pastel partners. 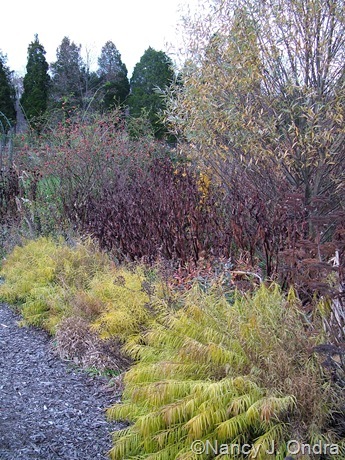 Below, it’s with pale purple-blue ‘Purple Smoke’ baptisia at left and soft yellow ‘Carolina Moonlight’ baptisia at right. Arkansas bluestar does a good job covering the leafless lower stems of other roses, too. 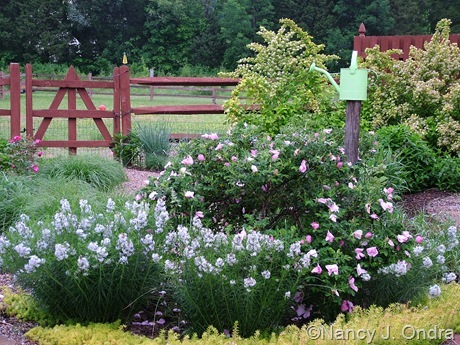 Below, it’s filling in around blue-leaved Rosa glauca and creating a nice show with an unnamed white hybrid clematis. Giant fleeceflower (Persicaria polymorpha) comes into bloom around the same time as Arkansas bluestar, making for another pretty floral combination. …and silver-fleeced lamb’s ears (Stachys byzantina). After the bloom period, the key summer features of Arkansas bluestar are its rich green color, its fine texture, and its dense, mounded habit. 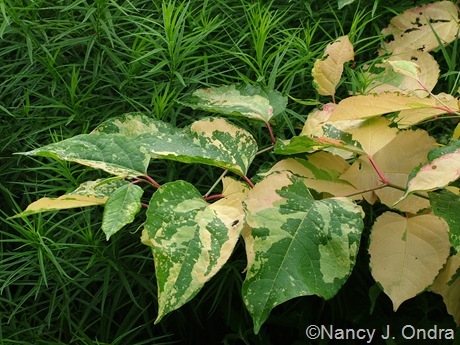 The foliage makes a pleasing contrast for partners with broad and/or light-colored leaves. Below, it’s behind Fallopia ‘Devon Cream’. 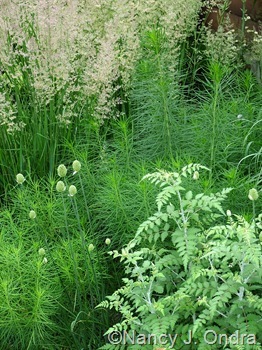 And here it’s with the lacy foliage of ‘Silver Fern’ ghost bramble (Rubus thibetanus), the rounded buds of drumstick chives (Allium sphaerocephalon), and plumy ‘Karl Foerster’ feather reed grass (Calamagrostis x acutiflora). 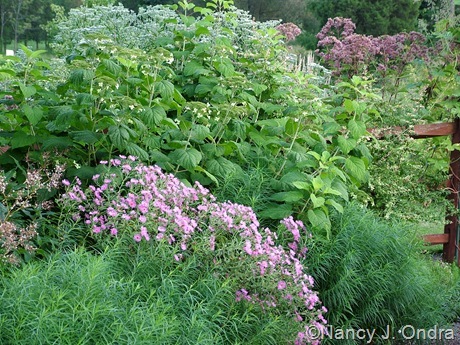 Where I use Arkansas bluestar as an edging plant, I like to shear the mounds back by about half once the flowers fade. 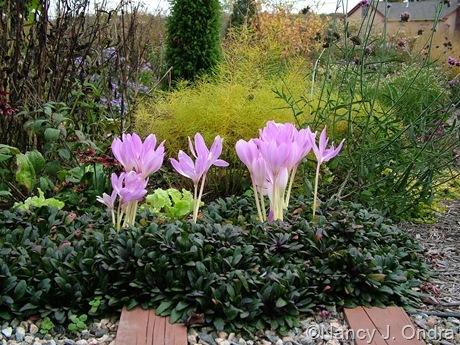 The trimmed clumps regrow quickly and are much more tidily bushy. 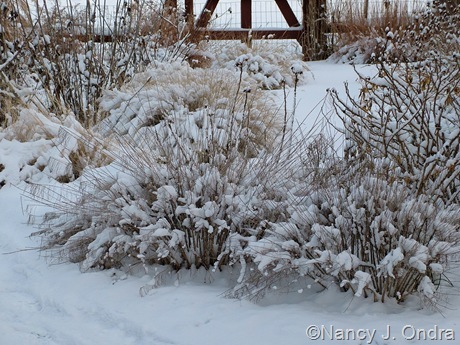 (This simple pruning step also removes the developing seedpods and prevents self-sowing where I don’t want seedlings.) Below is a shot from early July, showing clumps that were sheared about a month earlier. 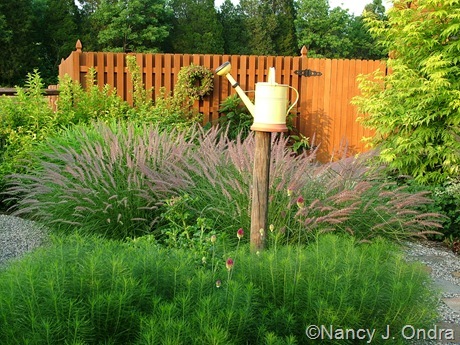 Behind them are a few clumps of ‘Karley Rose’ fountain grass (Pennisetum orientale). 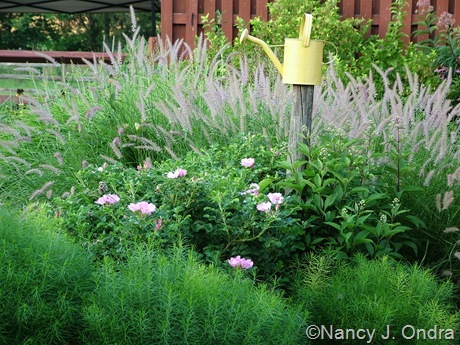 Below is the same spot a few weeks later in the season, with ‘Frau Dagmar’ rose between the bluestar and the ‘Karley Rose’ fountain grass. Arkansas bluestar does a super job covering the lower stems of summer bulbs, such as gladiolus, lilies, and tall alliums. 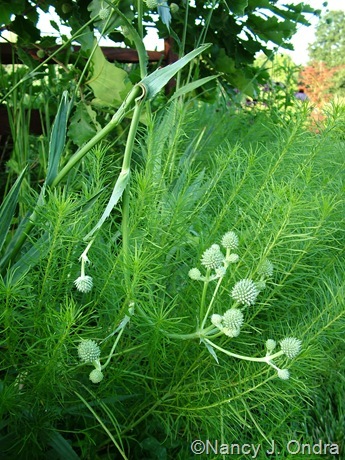 Below is the bluestar with drumstick chives (Allium sphaerocephalon). Honestly, it’s not an ideal combination, because if you don’t cut back the bluestar after bloom, the drumstick chive flowers barely reach above the bluestar foliage. 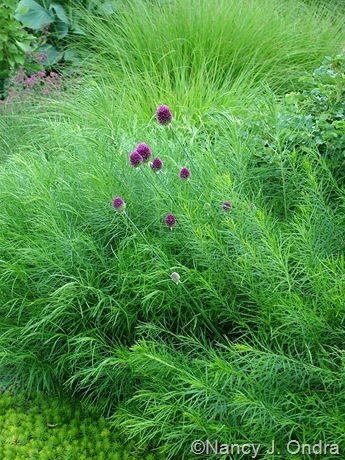 But if you do shear the bluestar, you need to be very careful not to cut off the allium buds that are mingling with the bluestar stems. 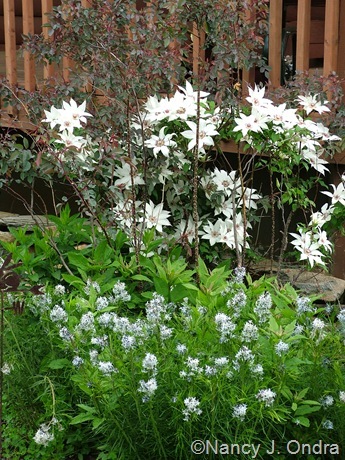 Arkansas bluestar clumps aren’t strong enough to hold up much taller or heavier plants, but they can prevent somewhat sprawling, lightweight partners from falling all the way to the ground, and this mingling can make for some pretty vignettes. 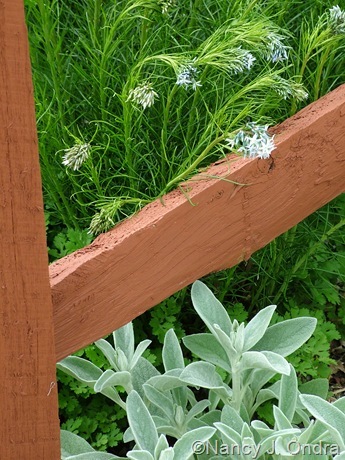 Below is Arkansas bluestar with rattlesnake master (Eryngium yuccifolium). 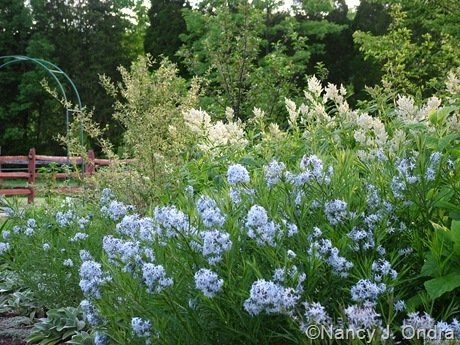 Mostly, though, the tidy mounds of Arkansas bluestar make a nice green filler for summer borders. 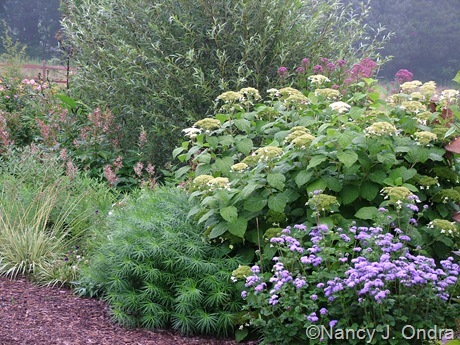 Below, it’s with ‘Blue Horizon’ flossflower (Ageratum houstonianum), a no-name hydrangea, silver willow (Salix alba var. 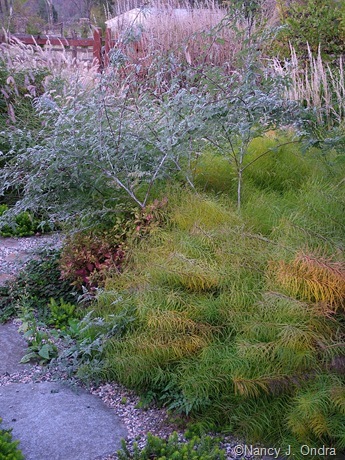 sericea), giant fleeceflower (Persicaria polymorpha), and variegated moor grass (Molinia caerulea ‘Variegata’). 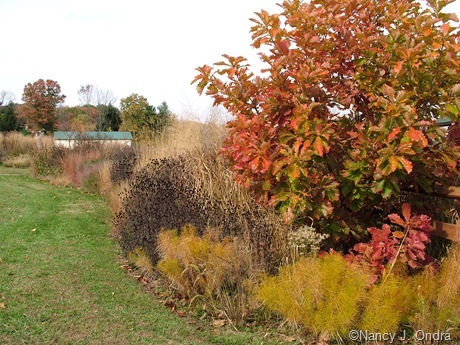 Here’s the same area from a different angle, in a different year, with the bluestar echoing the mounded forms of a summer-pruned pink New England aster (Symphyotrichum novae-angliae), the hydrangea, some pink Joe-Pye weed (Eupatoriadelphus maculatus), and some white snakeroot (Ageratina altissima) at the very back. 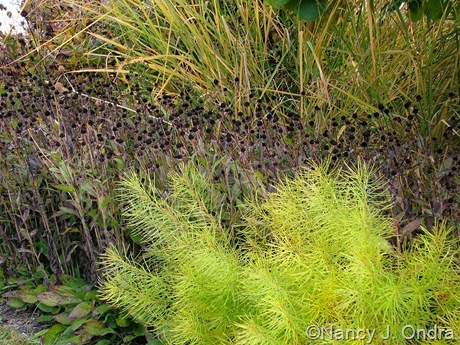 Below, it’s underplanted with ‘Angelina’ sedum, with the seedheads of giant coneflower (Rudbeckia maxima) in the background. 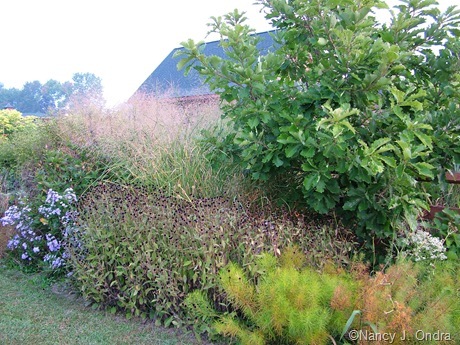 And the same bluestars a few days later, from a different angle, with a variety of flowering partners, including Joe-Pye weeds, ‘Frau Dagmar’ rose, ‘Karley Rose’ fountain grass, frost grass (Spodiopogon sibiricus), and pink phlox (Phlox paniculata). 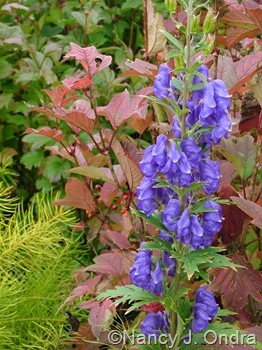 …and the fall foliage of ‘Bailey Compact’ cranberrybush viburnum (Viburnum trilobum) – below with monkshood (Aconitum carmichaelii). 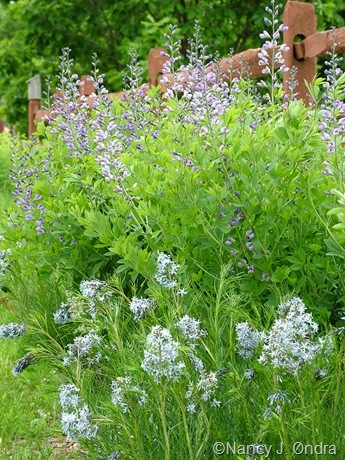 The autumn color of Arkansas bluestar looks terrific with other late bloomers, too. 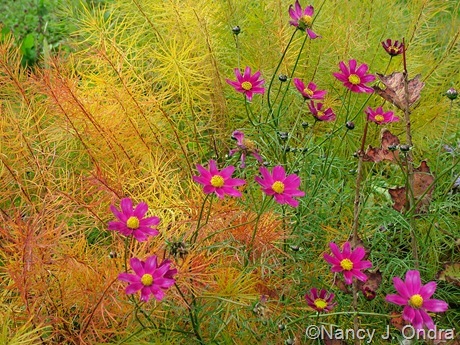 Below, it’s with cosmos (Cosmos bipinnatus). 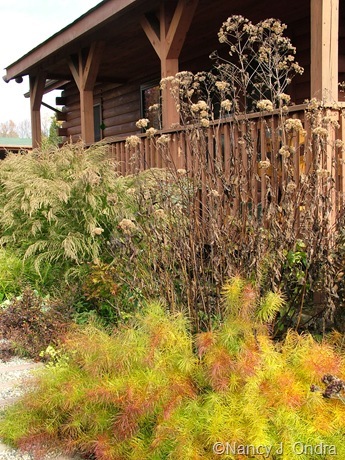 The bluestar’s bright color also makes it a standout in plantings where its companions have already turned brown. 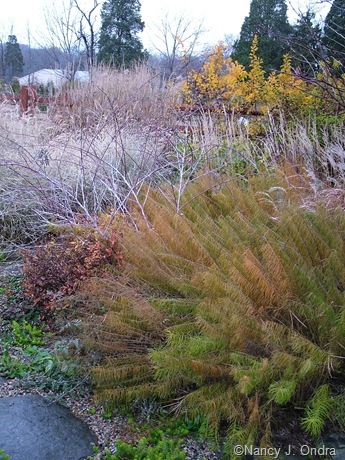 Below is an edging of bluestar in front of the dark, dried stalks of giant fleeceflower (Persicaria polymorpha). 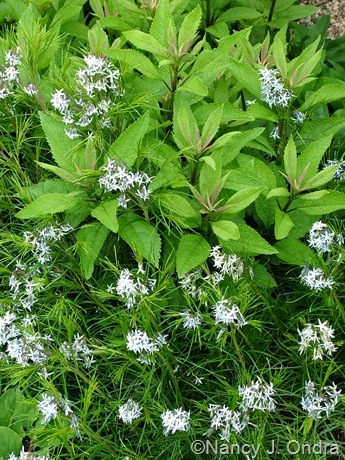 Below, it’s skirting a clump of ‘Carin’ Joe-Pye weed (Eupatoriadelphus maculatus). …and purple coneflowers (Echinacea purpurea). 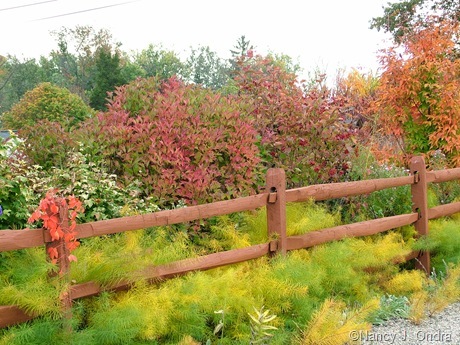 And, of course, there are lots of options for foliage combinations. 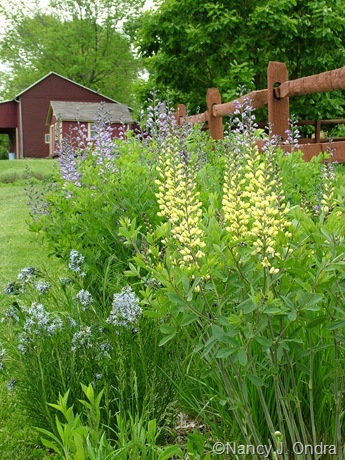 Below is a bluestar showing off against a clump of still-green ‘Purple Smoke’ baptisia. …and with a variety of colorful companions. 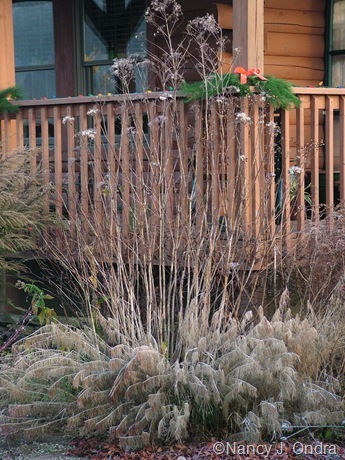 Arkansas bluestar doesn’t look especially durable, but it maintains a presence through fall frosts. 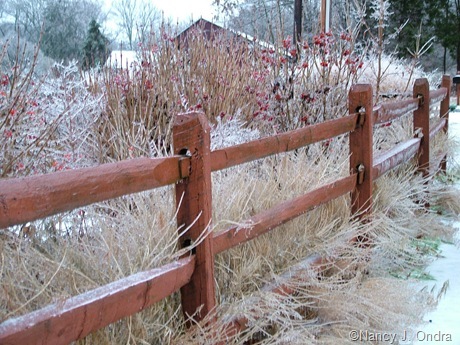 …and snow, even as late as February. 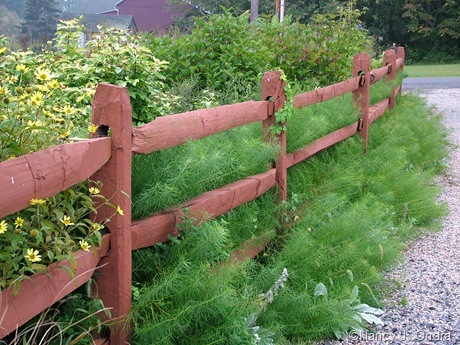 Bluestar has been a perfect solution for planting under post-and-rail fencing: it softens the hard lines of the rails and almost eliminates the need for weeding or trimming under the fence. Plus, it provides lots of seasonal interest. And as I mentioned before, Arkansas bluestar is invaluable for filling space. Because the clumps rarely need to be divided, I’ve found them especially useful for filling in around the base of trees and shrubs, where I don’t want to have to dig frequently. This last set of images shows Arkansas bluestar around the base of Japanese emperor oak (Quercus dentata). Once again you’ve added many more plants to my “to get” list! 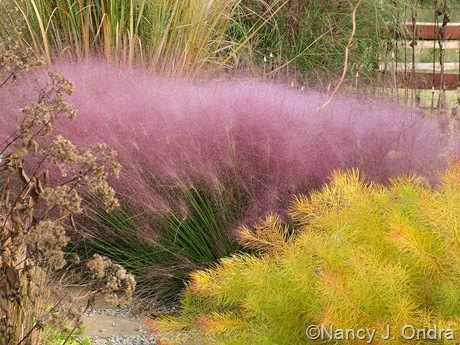 The amsonia with the muhly grass is awesome. 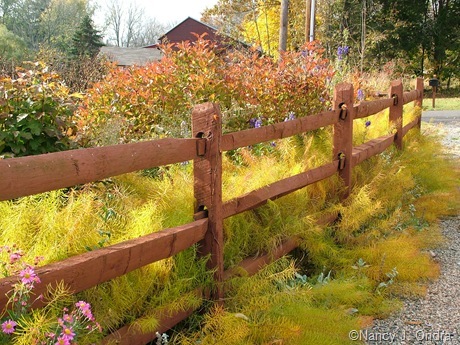 And I really like how it dresses up your fences! Oh, Dave – if you don’t already have this bluestar, you really need it. 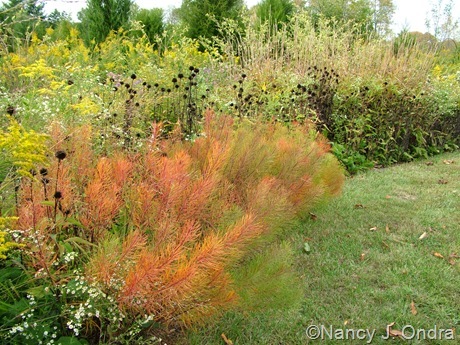 If you can’t find it locally, I can send you seeds this fall. 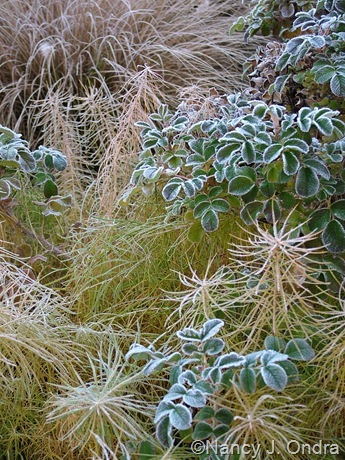 It germinates readily in spring when sown in pots (or directly in a nursery bed) and left outside for winter chilling. The muhly grass has been a little touchy for me in mid-Zone 6, Shane, but it’s definitely worth trying. It did well here in that one site for several years but suffered when I moved the clumps about 10 feet away. I should have known that new spot would be too wet. Choose your best-drained site to start with to increase your chance of success. It just goes to show that one must not listen to “them”. 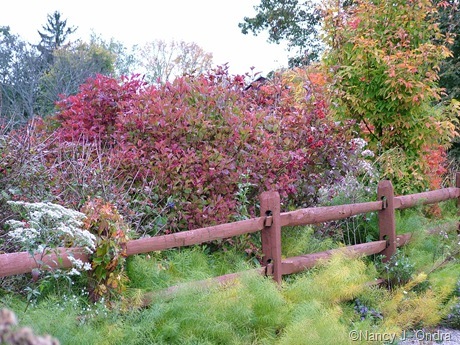 Grow what is hardy in your garden and is beautiful. They will be the stars of the show no matter what “they” say. Right on, Lisa. I think we all go through cycles of liking and not-liking certain plants: sometimes we might be into rarities, and sometimes we might need the tried-and-true favorites. In my old garden, I wouldn’t have anything as ordinary as phlox or rudbeckias, but I certainly appreciate them now. I’ll admit to still having a weakness for the odd and unusual, but unless I can grow them from seed, they’re mostly out of reach – for now, anyway. I too read that comment about Arkansas bluestar and was perplexed. As soon as a plant gets some well deserved notoriety it is out? 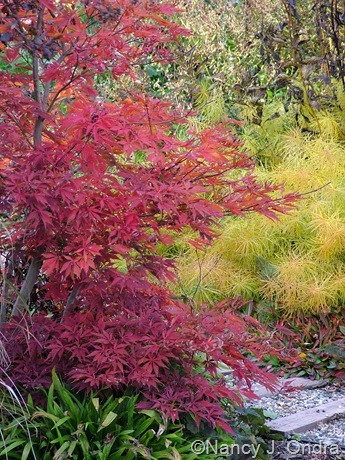 The yellow-orange fall color looks amazing with the fall color of ‘Sango-kaku’ Japanese coral bark maple too. Oooh, I can imagine that, Carolyn. Thanks for sharing that idea; it’s worth copying! It’s not out! Had it for years and it’s in my top ten! The fall color, as you noted, is out of this world–that’s why I use it and love it. Amsonia, I think I love you! Amen, Benjamin. It would be in my own top three, if not my top one. 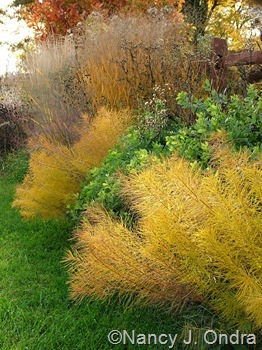 I think the only way it could be better would be as a form that had yellow foliage all season – and that came true from seed, of course. 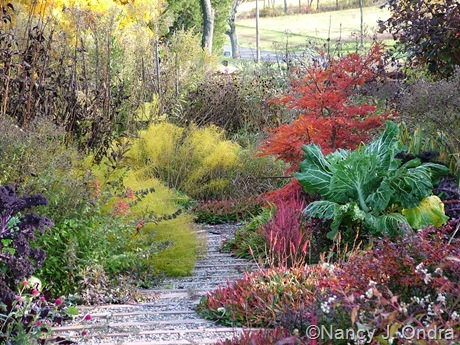 Real gardeners don’t pay attention to which plants are in or out. I shudder to think about those that pay attention to such nonsense and am concerned about those that disseminate such marketing misinformation. I agree, Allan – predicting trends is pretty tricky business. I guess the danger depends on the audience the writer is trying to influence and how many of those people are willing to believe those predictions. Well-reasoned arguments are interesting, but broad statements of “what’s hot and what’s not” in gardening are hard to take seriously. “I have a whole lot of space to fill, so I can’t be snooty about sturdy, dependable, and affordable plants.” Hear, hear, my sentiments exactly. 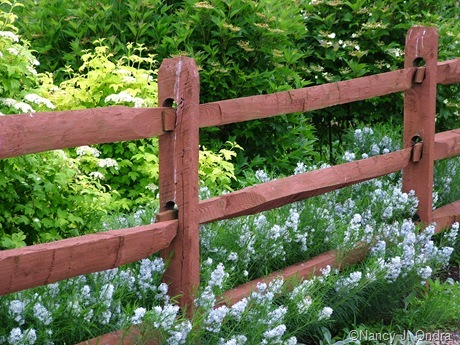 Your garden, by the way, is so astonishingly well planted, and breathtakingly beautiful. Love your pictures, and dream of visiting. I’ve gotten a bit complacent about my own garden’s plantings, as I’ve grown older and less energetic, but you inspire me. Thank you so much, Yvonne. I think you deserve to be complacent. I look forward to the day that my plantings are as complete as yours! But then, it’s also fun to have new projects to tackle, when time and energy allows. Well, I enjoyed this retort, Nan. Almost any photo of yours makes a plant “hot”. Of course, I knew I’d get guff for writing the “what’s hot” post. It was mostly written to be silly, imitating the ridiculous post Oscar commentaries on fashion. That being said, any gardener who thinks they’re immune from fashion and trends I would argue is naive. A quick survey of the last 1000 years in garden history shows that fashions, trends, and ideologies shaped the way people garden. The same is true today. I think we are better off knowing the trends and reacting to them (as you did wonderfully in this post), rather than pretending we are ABOVE trends, yet influenced by them. 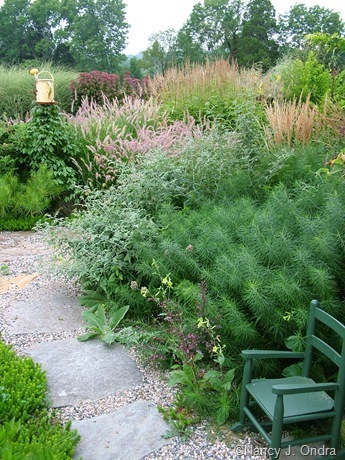 Gardens are an act of self-expression, and plants are signifiers. 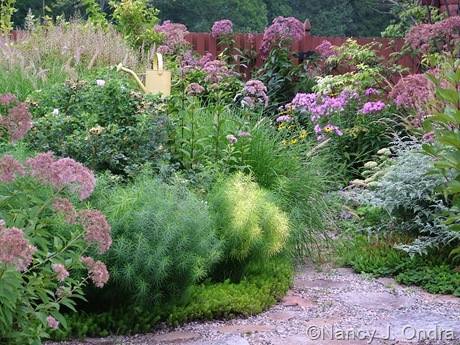 If you use a plant that every designer and landscaper from Maine to California is using, then that says something about that garden. 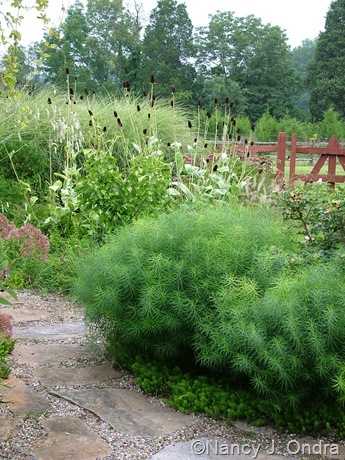 By the way, I ADORE Amsonia hubrictii and would encourage anyone to use it. And finally, by the time the PPA crowns a perennial of the year, it is already ubiquitous. They are not trend setters, but namers of the obvious. Heavens, Thomas – it was your post? I’m blushing but very grateful that you didn’t take offense at my response. Obviously what you wrote gave me a lot to think on and came to mind when I was deciding what to write about. I can understand that you’d have different needs and standards as a designer than I do as a home gardener. And definitely, I can see your point that you lose a sense of place when you see the same plantings used in widely different climates. Thanks for the inspiration, and for the added insight! By the way, Nancy, I think YOU are a trend-setter, a taste-maker. Of course, you are too humble to ever acknowledge that, but it’s true. 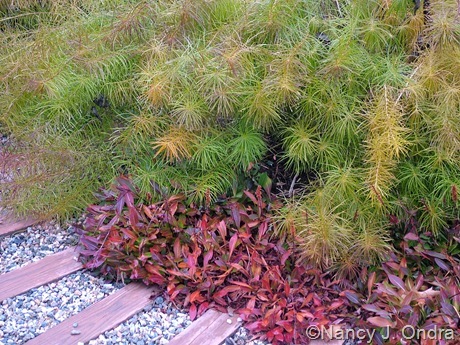 Your photos and books make me see plants in new and exciting ways. You are a plantsman’s plantsman. I go to your blog and books to when I’m looking for something fresh and original. You call yourself a gardener, but you are a muse to thousands of designers. Keep up the great work! I don’t know what to say, Thomas, except…thank you. Wow. Amsonia hubritchii is not a common plant here in Sweden, but 3 years ago I find a pot at a garden center. I bought it to test, because the wonderful autumn colour. But…..I have never seen that here, it didn´t survive. After reading this I should try it again! Sorry to hear that the bluestar didn’t make it for you, Susie. It would be worth another attempt, if you can find one, though maybe its scarcity in Sweden indicates that it didn’t perform well for other gardeners there either. If you do find someone that’s had luck with it, maybe you could try getting some seed from their plant to see if that would produce better-adapted seedlings. What an utterly fabulous plant, I can’t believe that it has been declared “out”. If I can persuade myself that it will cope with my slightly heavy soil it just leapt to near the top of my must-have list. Thank you for a wonderfully illustrated and informative post, I love the way you demonstrate how to use a plant effectively rather than just profiling it in isolation. It has also reminded me that I need to take lots of photos from exactly the same vantage points to track planting combinations. I bet it would do just fine for your conditions, Janet. My soil here is on the silty clay side: moist to soggy for much of the winter and spring but (usually) dry in July into September. The wet doesn’t seem to bother it at all, and last year’s drought didn’t affect it much either, except that the regrowth after June pruning wasn’t quite as lush as usual. 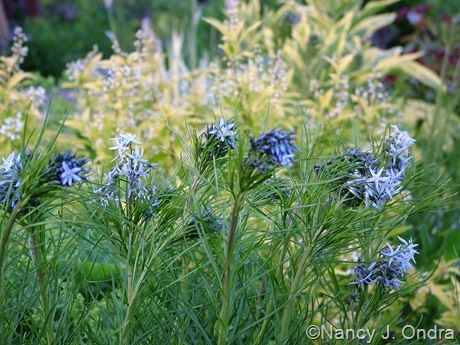 I love the idea of using Amsonia to support Eryngium yuccifolium. Mine are always flopping! Yep, mine too, Rose. The bluestar doesn’t hold them upright but at least keeps them from keeling over completely. You’re too funny, Scott. Thinking so much about this plant has given me the idea for rather extensive new garden project. Now, I just need about about 70 more clumps of amsonia, so I guess I’ll be hunting for self-sown seedlings this spring and moving them to a nursery bed for a year or two. It does seem to take 4 or 5 years for seedlings to look really lush, but then they just keep getting better. So far, I’ve never had one decide to fade away after getting established, though it does seem to take older plants or divisions a full year to recover after being moved. I’m not sure where you are, Kim, but here in southeastern PA, in my little corner of upper Bucks County, the deer don’t eat my amsonia – yet another reason why I depend on it so much. 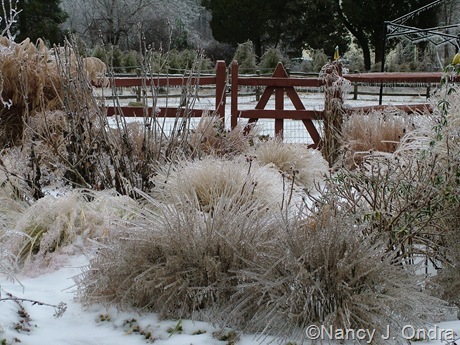 The plants occasionally get trampled, but at least they’re not munched on. Around here, though, the deer have plenty of space to roam and, apparently, tastier stuff to eat. I’m told that in lower Bucks County, which is much more developed and has much more concentrated deer populations, amsonias (and even hellebores) are not safe. Still, I don’t think they’re in the same deer-candy category as daylilies and hostas. Mercy me, I am so very glad I planted these a couple of years ago, now I look forward to the future! I know what you mean about plants disappearing or shrinking, I would much rather wait for a plant that takes its own sweet time. Amsonias are a superb long-term investment, aren’t they? I wish you a long and happy association with yours! You always show a plant with its best co-stars. Really, Nancy, great job. I really wish you were on the talk show circuit. Your photos alone are inspiring but your experience rules the day, week, month, year and all seasons. Well, really, It’s pretty hard to take an unflattering picture of Arkansas bluestar once it gets going. It’s curious how some plants almost always look good in pictures and others are tough to photograph well, even if they look great in the garden. Kind of like some people being better in writing than in person, I guess. I agree that this is a fabulous plant and was glad to see it selected as the plant of the year. 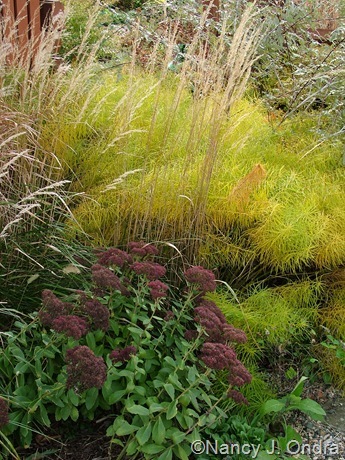 This is so easy to grow, and as you’ve demonstrated, she looks great in so many combinations and in different seasons. I have no complaints about the seedlings that I get! Hey, Cameron, thanks for stopping by. It’ll be interesting to see how available the plant really will be this year. I haven’t seen all that much press about it, but maybe it’s a bit early yet. 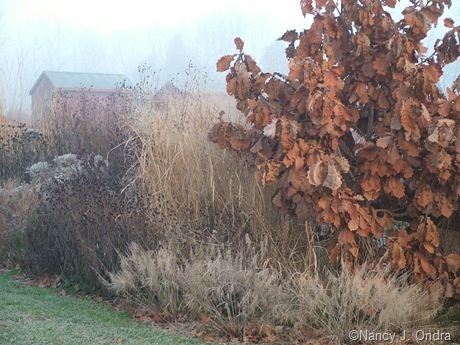 Nancy- every time I think I have my list ready for this summers purchases for the garden… I make the mistake of wandering over to your site and the list is scratched out and new plants are added. Your blog is my go-to website for new, interesting plants and if I just want to learn. I have all your books and have poured over them all winter. Now I must go buy a lottery ticket to pay for all the new ideas on my list. Thanks you for letting us sneak a peak over the garden gate. Sorry to keep causing revisions to your must-get list, Heidi. Though I have to say that I find making lists and hunting for the plants as much fun as actually growing them, so I don’t feel *too* guilty! Hope you have a great growing season. 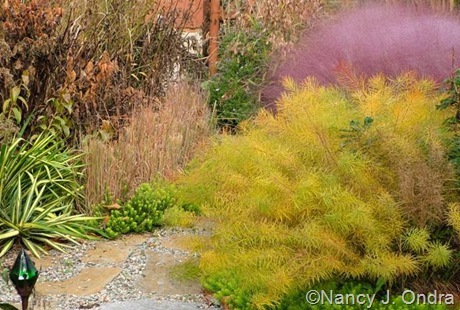 Like many others here, I have been taking notes while reading this post, Nan;-) Now my plant list has about tripled from what was already really long! I love how you are able to show off a plant with others as backdrops. So many times our photos are of the specific plant we’re focusing on, leaving out what surrounds it. You have what many would consider a dream garden (I do!). How gorgeous it must be in person. 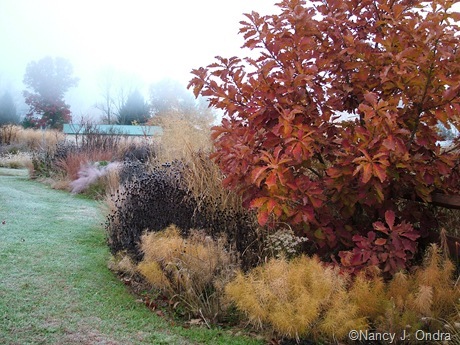 Great to hear from you, Jan. As I’m sure you can imagine, the garden isn’t looking very dreamy at the moment, but I have high hopes for this year. I’m wishing you a great year too! These are the best plant combinations I’ve ever seen! I just ordered some plants! Super – another amsonia appreciator! I hope your new acquisitions perform gloriously for you, Clint. That’s Ajuga ‘Valfredda’ (a.k.a. Chocolate Chip).